This entry was posted in 1940's, Launches, Non Waitemata, Working Boats and tagged Anita Bay, Anita Bay / Te Repo Repo, Anita Bay IV, Boats of Taupo, Internal Affairs Harbour Master, Lake Taupo, Lidgard, Roy Lidgard, Taupo, Te Repo Repo, Tourist Hotel Corporation by Alan Houghton - waitematawoodys.com founder. Bookmark the permalink. Anita Bay came from the sounds to Tauranga in about 1962 and was hauled out at Alan Harris’s “Sulphur Point” slipway on the “Eva’s” cradle (55″) she was craned onto the truck there by Ministry of Works Michigan mobile crane brought down from Auckland for the job. No expense spared for the N.Z.Tourist Corp. The whole procedure was repeated the following year when she was returned to Tauranga.for disposal. She then went up to Whangaroa and operated for the “Kingfish Lodge” for quite a time hauling passengers and goods there before being acquired by Kieth Wright (Wrights Sand Co) Whangarei. 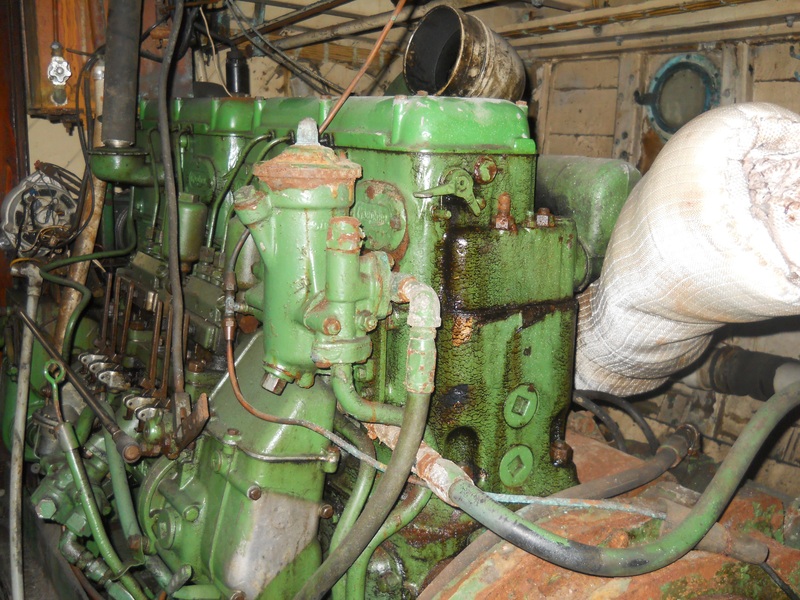 she still sported the twin “Buda” engines then.The purpose of the elevated rear wheelhouse was to remove the skipper from the rabble in the “lounge bar. I am also sure the ports were blanked off for the open sea journey both to and from the sounds and also the cabin windows had storm shutters fitted. Back in the time coastal deliveries of any surveyed craft were done by crusty old ticketed men.I was there on both occasions when Anita Bay went to and came from Taupo. There was another old T.H.C. launch from Taupo became “Abalone” 2-71 G.M. rebuilt in A.A.Harris’s yard and run by Ces. Jack for many years. Any new intel on the good ship? I’ve not heard anythng for a while. Yesterday (1June) I was speaking to a son of a previous owner of the Anita Bay and he remarked that some felons had uplifted a quantity of bronze fittings from the shed she is in. If it is true, be on the look out for fittings on TradeMe in case they have not already been melted down. Scrap is lucrative so keep your goodies secure. Tough doing a boat when this happens. 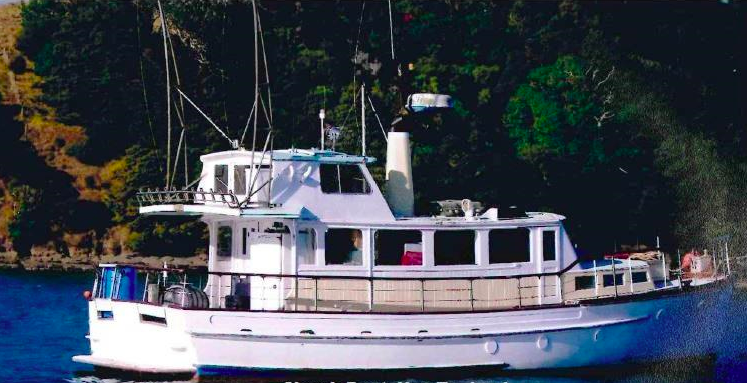 THE RED ANITA BAY, COLLINGS AND BELL HAS JUST BEEN LISTED ON TRADE ME LOOKA A GOOD BUY..
Further on the above, I see that the content of the brochure stating the boat as Anita Bay at Milford Sound prior to going to Taupo was also highlighted previously in the comments. However, it is not yet reflected in the summary at the beginning. Sorry for the repitition, but I got lost when the comments started talking about other boats entirely. Am I right in assuming that the RED Anita Bay is the Collings and Bell Donald Sutherland? Reading the brochure apparently printed for Te Repo Repo working at Taupo in the early 1960s (provided by Harold Kidd), it seems to say that she had previously been at Milford Sound under the name Anita Bay. The resolution of the brochure is not very clear, but that would explain why there were two boats with the name Anita Bay, both of which appear to have worked in Milford Sound. I was at Milford Sound just yesterday and the skipper of the tourist boat I was on told me that the ‘other’ Anita Bay was out of service, stored on permanent hardstand at Anita Bay. I did not have a chance to talk with him further or even go to see the boat as the weather was closing in and the tourist bus driver wanted to get away ASAP. Looking at the photo of the Anita Bay (ex. Maharatia) in 1998, the name appears to be Anita Bay II rather than Anita Bay IV mentioned in the text. The addition of the II would make sense if that boat had applied for registration and the other (current Milford Sound) boat was previously registered under the same name. The late Colin was brother of John Stewart I think -yes a lovely man. Their father was “Steam Stewart” a real steam enthusiast. Colin very kindly gave me a set of castings for a steam engine for a model boat I built when I was 13. I machined them up and still have the engine. I knew Aurora well. No, Aurora was quite a different-looking boat boat, John. Both on swing moorings back then and impossible to confuse even without glasses. Jimmy told me that he assisted Fred with building Rongomau….. Lovely ship. No wonder -that and he et tu brute. He must have been crook! Rongomau was built at Kawau, another similar design Lady Leila was partially built at Kawau and completed at Bayswater. Jim would have been about 11 or 12 when he arrived at Kawau so maybe ’51 – ’52. I would prefer if you fed the whisky to your steamer and we had cups of tea. Caesar aderat forti. Russell, it is Awarua not Awatere in the “Full House” shed pic! Tch. I’ve got a good idea for a cold winter’s evening -while we still have them and while most of us are still alive. Let’s rent Cobweb Corner from RNZYS, lay on a dozen bottles of Islay Malt (eg Bruchladdich) and have eight of us slogging it out up front. Last man standing. $10 a head for the viewers who want to learn a lot of things about nothing in particular. Mediator Alan Houghton and a series of hitherto unpublished photographs provided by the Illustrious Eight say two per person. The discussion not to start until eight of the bottles of the said Malt have been consumer. Well, for one thing, you were 9 or perhaps 10 years old in 1946 and for another, Jimmy was 4 or perhaps 5. Then again, he was living with his folks in Raro in 1946. No doubt he was a lively and precocious lad, as undoubtedly you were too, but aren’t you pushing the limits of your credibility for WW followers? Awatere up alongside Anita -A full house of Lidgards almost…..
Sure is dear ole Matanui -well spotted Nathan! With the new wheelhouse no less. Who’s in the back corner, perhaps Matanui? Without cross-checking. Oh my, this is a long thread! Getting back to the two boats in the shed, Medway was owned in the late 70’s by Barry Davenport (first person to swim Cook Strait) We last spotted her in Picton marina about eleven years ago, looking rather down at heel. Paul’s conclusion is fundamentally correct. The text of the left hand page of the flyer above is hard to read, but says.”….Under its original name of MAHARATIA the launch was well-known in the Bay of Plenty where she was used for fishing charters. She was purchased later by the Tourist Hotel Corporation, renamed ANITA BAY and put into service on Milford Sound. In 1962 she was brought by sea to Mount Maunganui and thence overland to Taupo where she was given the name TE REPO REPO (a legendary war canoe said to have been propelled by 100 paddlers. )” That’s pretty clear. Hopefully, since I last looked 24 hours ago, Jimmy Thomson has been restored to clan Thomson and THAT particular obsession on the part of Ken Ricketts removed once again from this universe back to the parallel one he seems frequently to inhabit? Kia manuia koe, e tama. Fantastic new info & pics, — The reason MAHARATIA became ANITA BAY “IV” & did not remain, just as per her original ANITA BAY rename, without the “IV” was undoubtedly because there had been 3 others before, that had all been given liquor licenses– (probably all belonging to the THC Hotel at the sounds) & they all would had to have an individual designation for the licenses when applied for, by then, which would have been discovered by McLeod when he applied for his licence, hence the “IV”. Ahhh. A prob solved?? Two sister bridgedeckers on view in the Lidgard shed. One Monteray AND one Medway? There used to be a bridgedecker on a swing mooring in Whakatakataka Bay by the railway line in the late ’50s early ’60s. We used to pass her in Millie ll when sneaking out the upper entrance of Judges Bay -the one we used when the tide was so high we couldn’t get out under the road at the other end. I always thought she was named Medway (because that was what the nameboard said (but old memories can adorn and emballish) and adored her good looks. But then Monteray started appearing on the WWs entries -down in Taupo at one stage. Were there two ships? Honour is satisfied. Jim was certainly there when Rongomau was being built at Lidgard’s Bayswater wharf. He helped! -The reason he is so sentimental about her and owns her. Lovely boat -just beautiful. I’ve said before he was a deckhand for Capt James Lawler on Ngaroma when I first met him in ’67 or ’68. And Andy was the skipper of the wonderful Island schooner TIARE TAPORO. He and his wife lived at Titikaveka on Raro and sent Jimmy to live with the Lidgards when Jimmy outgrew the local school. I think this is yet another repeat by Ken Ricketts of the legend…..third? fourth? Often he has Jimmy present when early Lidgard boats were being built when, in fact, Jimmy was innocently attending the Side School in Avarua at the time, a couple of thousand miles from the Lidgard yard. Maybe Ken just doesn’t read the WW posts…..or assimilate them? I spent some time with Andy in the late 60s at his home. Hugely impressive man! How you slave for us aged parent! Oh BTW, Christine Thomson was a Lidgard…. You’d know that! Will do, along with any Ken R may have sent through. My dad and Colin are working so hard to make her original again, i’ll make sure to send through any updated photos to you as the happen. Very interesting stories and just what I had hoped for when sending in the pic of TE REPO REPO on Don McLeod’s truck. Her skipper whilst at Taupo was definitely the Internal Affairs Harbour Master, Lt.Cmdr. Pete Petersen, RNZNVR, who was Harbour Master from 1955 until 1978. He is fondly remembered. In those days, he was it – just him and his Imperial typewriter. I would question whether this vessel went from Taupo to Milford Sound, or from Milford Sound to Taupo.. I think she came to Taupo from Milford Sound BUT I HAVE NO EVIDENCE and anyway it doesn’t matter. One thing is for sure and that is that she arrived at Taupo, and left from Taupo, on the back of a truck! The stories of her southern adventures are new to me and most interesting. I would never had guessed that she was Auckland built and had her down in my mind as Otago built. 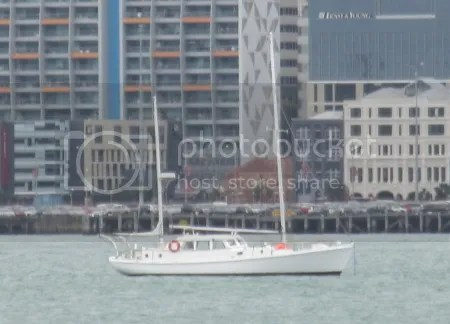 She has, to me, the rugged good looks of a Southern boat, rather than the less rugged but still good looks of an Auckland boat. lets not be a slave to detail Harold 😛 nothing gets in the way of a good story more than facts. Um, that’s COLIN Brown not DAVE Brown. What is the logic behind the blanked over portholes and the aft bridge? rear vis? I’d just have a fwd station then a remote in the cockpit? I’ll drive at a safe distance with a rescue crane and road cones!!! As built, she was a fine little ship. The pic at Lidgard’s brought back so many fond memories. Roy built some fine boats: There is a certain daintiness (if you’ll forgive me) in the hull and sheet that sets them apart. I look at the ferry Kawau Isle at the Maritime Wharf in particular. A workboat (consider Barbara W also) needn’t look brutal. The clients of old would surely have been attracted to a good looking boat rather than a brutal box the likes of which abound these daze. Forgive an old codger his raves. Nostalgia ain’t what it used to be. Onward with the chainsaw cosmetic surgery! Err actually the first bit may have, but she was heading for Omaha after that. My parents purchased her in 2013 and are in the long process of restoring her back to her original self and namesake. So great seeing these photos to know we are heading in the right track! Saw her last year having a vv big makeover in Whangarei I think Colin Brown from Sandspit was doing the work so it will be a proper job. I heard of someone else wanting to take an old launch to Taupo the same way? sure did have a lax attitude to H & S back then. Can you imagine trying that these days….